These impressive chenets, with laurel-draped classical urns supported by Ionic columns, a Vitruvian scroll frieze and splendid recumbent lions, reflect the fashionable taste for the goût grec of the 1760's. This movement away from the free-flowing naturalistic forms of the rococo, to a sober, architectural style based on neo-classical forms, was promoted by influential architects and ornemanistes such as Louis-Joseph Le Lorrain and Victor Louis, and espoused by sophisticated collectors such as Ange-Laurent de Lalive de Jully and the comte de Caylus. Among the bronziers who worked in the new style were Philippe Caffieri, son of the noted Louis XV bronzier Jacques Caffieri, Jean-Louis Prieur (who worked extensively along with Caffieri on one of the most important neo-classical commissions of the period for the Royal Court of Warsaw), and Quentin-Claude Pitoin, who was one of the principal suppliers of bronzes d'ameublement to the Garde meuble de la Couronne from 1763 until his death in 1777. 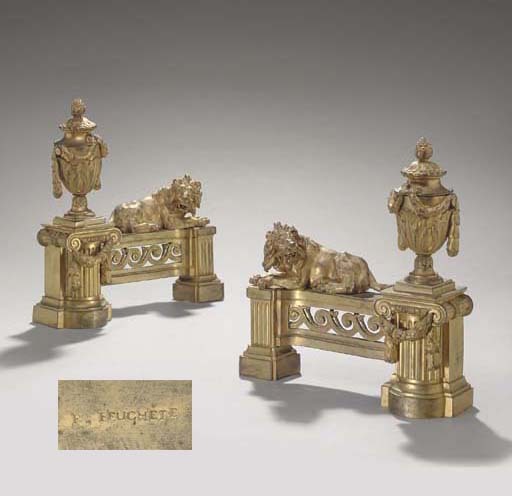 This pair of chenets was delivered by the marchand-mercier Claude de la Roue to the Dauphin for his bed-chamber (S. Eriksen, Early Neoclassicism in France, London, 1974 p. 226). A closely related pair of chenets also fitting this description and in the collection of the Musée des Arts Décoratifs, Paris, is illustrated in Eriksen, pl. 225. (illustrated below). The maker 'Feuchete' appears to be unrecorded,although it is possible that it is a misspelling for one of the celebrated Feuchère family of bronziers, notably Pierre-François, maître in 1763, and Jean-Pierre, maître in 1767. They are best known for their high quality work in the 1780's in the more delicate goût étrusque style, and supplied many pieces to the Garde Meuble.